With only two EPs under their anonymous names, the gloomy Deathwhite was picked up by Season of Mist last year, just before their first official full-length was set to hit the streets. An impressive feat for a band that has had to travel solely through experience with the previous material. They have yet to grace the stage with their presence (though it may change). But it should come as no surprise to those who heard the Solitary Martyr EP, or the lucky scribes able to have heard the entire album last year before the self-released promotion was called to an end. The now released For a Black Tomorrow is an excellent piece of melancholic metal. Taking the strengths of their previous EP, there’s plenty of ebb and flow in the sorrowful material, which never plays into the usual antics of adding growls to simply diversify their output. Instead, it comes across as an honest and emotional piece of music, an increasingly rare occurrence in our trend-fueled times. 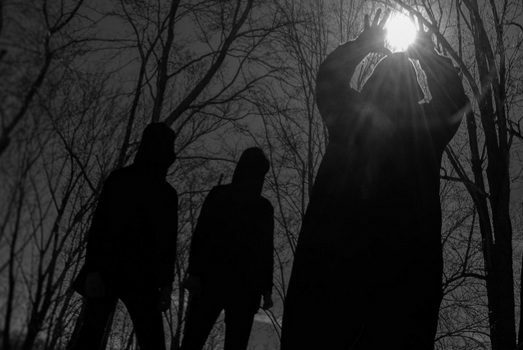 We caught up with the band electronically to discuss the waiting period before Tomorrow’s release, the hooded figure that adores two releases, and a dissection of the album in question. Dead Rhetoric: The album was almost released independently in March of last year. Was it tough to sit on the finished product for that time while working things out behind the scenes with Season of Mist? Deathwhite: Yes and no. Since we originally intended to release the album ourselves last year, there was, obviously, a level of anticipation and excitement on our end for it to see the light of day back then. We signed with Season of Mist literally a week before the album was to be released, so we had to pull it and refund those who were kind of enough to pre-order it. When you think about what a strong label Season of Mist is and how supportive of the band they’ve been, it makes waiting another year pretty tolerable. Plus, there was a lot of things they’ve done in the interim, like funding a video, creating different versions of physical product and lining up promotion that really helped along the way. Therefore, there are no complaints on our end. 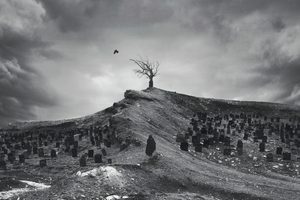 Dead Rhetoric: Was it daunting at all to realize that the self-released album you had written was now going to be released on a high profile metal label? Deathwhite: Somewhat, although we wouldn’t release albums if we didn’t feel confident in the material. All this means is that our music will be exposed to a broader audience, which is all a band like ours could ask for. Even as an unsigned band, we had a good promotion team behind us, Clawhammer PR, who were crucial in getting Solitary Martyr into the right hands. Such partnerships are essential for a band like ours who has yet to play live and maintains a relatively low-key internet presence. 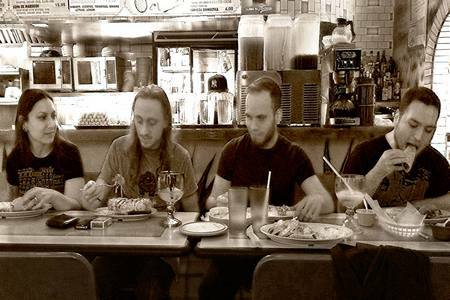 Dead Rhetoric: What made signing with Season of Mist the right move for the band? Deathwhite: We actively sought out a few labels and Season of Mist were always at the top of our list. They don’t cater to one style, they have excellent resources, a sterling reputation and above all else, some really great people working for them. They understood that we are not exactly a conventional band and we don’t have the same priorities as other bands on the label. To their credit, they’ve been supportive of everything we’ve done thus far and have been quite accommodating. Needless to say, we were rather honored to be signed by them. 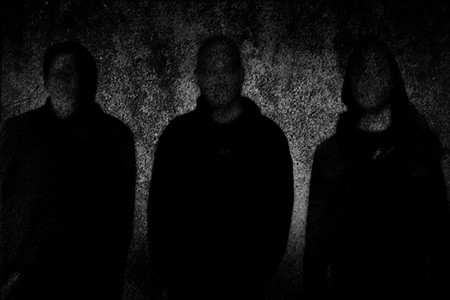 Dead Rhetoric: Solitary Martyr saw the introduction of a new vocalist. With assumingly the same line-up this time around, was For a Black Tomorrow easier to write as a unit? Deathwhite: Yeah, you could say that. Solitary Martyr was a big leap forward for us, one that happened faster than we anticipated. But, we were cognizant of the steps needed to push the band along and not avoid writing songs like the ones on Solitary Martyr. Granted, we have retained largely the same style, but For a Black Tomorrow is much more diverse. Dead Rhetoric: What progressions do you feel the band has made with the jump from EPs to a full length record? Deathwhite: For starters, we aren’t painting from just one brush, if you will. We wrote a variety of songs for the album, from slow, more atmospheric numbers, to driving, heavier material all the way songs bordering on progressive, which is where “Death and the Master” comes in. The songs for Solitary Martyr were written before we had a lineup change, so this was the first time all three of us experienced writing and recording a full album together. That alone sparked some progression. Dead Rhetoric: Talk about the hooded figure that adorns the Solitary Martyr release. Is this the same figure that sits in the middle of the cover of For a Black Tomorrow? A figure also seems to flash in at the end of the video for “Dreaming the Inverse” – is this becoming a theme for Deathwhite? Deathwhite: Indeed it has become a theme for us, one that started with Solitary Martyr. There was no grand plan when the cover art for Solitary Martyr was presented to us by our graphic designer, the great, Jerome Comentale, but when he created For a Black Tomorrow’s cover, the hooded figure appeared again. Since we like to maintain continuity, it made sense to leave this figure on the cover, then incorporate it in the video for “Dreaming the Inverse.” It was one of those things that wasn’t planned originally, but has since grown into something we feel is identifiable with the band. Dead Rhetoric: What was it like to be able to film your first music video for “Dreaming the Inverse?” Any memorable moments? Deathwhite: It was a very enjoyable experience. David Brodsky and team are total professionals and made the entire process of making the video an easy one. We didn’t know what to expect since this was the first video for some of us, but after we worked with David and team on the narrative, found the actors and determined the location, it all came together pretty seamlessly. We probably had the easiest job of anyone — we just had to show up and play. Everyone else worked incredibly hard, to which we are indebted. There was an errant flip of a steel desk that landed on the toe of one of David’s assistants, but outside of that, it was truly a great time for all parties involved. Dead Rhetoric: There is a certain openness/directness to the music of Deathwhite. Do you feel you can bear your soul a little bit more due to keeping anonymity? Deathwhite: We aren’t a complete warts-and-all band, although there is a personal element to our songs. It probably wouldn’t make a great difference if we did include our actual names, but we try to keep our lyrics relatable with a bit of metaphor. Anyone can interpret the songs as they sit; they may have a different meaning from one person to the next, even us. We may also be helped by the fact we have solely clean vocals — it certainly brings our lyrics and themes into focus a bit more easily. Dead Rhetoric: Going along with the anonymous angle, are you planning to do any live shows/touring – will you adorn hoods like in the video? Deathwhite: We have completed what will become our live lineup by adding a second guitarist and bassist. Therefore, the idea is that we will do select live shows across 2018 in support of the new album. Being that we were always reluctant to play live, these shows will be of tremendous importance to Deathwhite. Dead Rhetoric: Most outsiders tend to think of heavy metal as being violent and aggressive. But bands like Deathwhite are more rooted in introspection and melancholy. What’s the draw for the band to this type of presentation? Deathwhite: It’s something inside of you. It’s somewhat hard to verbalize, but when you hear a melancholic song that is played with all the right notes and has the perfect kind of vocals, it strikes a chord. There is something to be said for creating music with a degree of sadness and melancholy that can have an uplifting feeling. Now, there are some bands who are more morose and despondent than us, but we’re largely coming from the same place. It’s all about the delivery. A funeral doom outfit can have the same impact as a band like ours. It just depends on the listener. Dead Rhetoric: What do you feel makes darker music a source of inspiration and positivity for some people? Deathwhite: Along the lines of what we said above, dark music, when performed from a genuine place, can resonate with people who may share the same feelings. Metal and being upbeat and happy can happen, as history has shown, but music like ours is meant to explore some of the more challenging and difficult feelings we may have, so by doing that, perhaps there’s a tinge of positively lying underneath. Dead Rhetoric: What type of plans should we be expecting from Deathwhite this year, outside of the album release? Deathwhite: Beyond playing our first live shows and promoting For a Black Tomorrow, we have already begun work on our second full-length album. Presently, as in, while this is being typed, we have roughly nine songs ready to go, although we’ve yet to start on the serious demos. We’ve always done pre-production demos prior a recording that include full instrumentation, vocals and the like, so now that we are actively rehearsing, this process may be expedited a bit. Once the dust settles on For a Black Tomorrow, we hope to have an idea of what our next steps will be, which will hopefully include serious recording.